You looked through a fishing magazine and saw all those nice looking bass fishing reels. Admit it. You did, didn’t you! You see all the latest reels that new technology has to offer and you just have to have one! But you don’t know which reel fits on which rod. So let’s talk about each type of reel and see if we can figure this out. The Baitcasting Reel is difficult to learn how to use but has some good advantages. Casting accuracy and control are strong points of this reel. This type is used more with medium to heavy action rods and line 10 to 12 pounds or heavier. They have one drawback that is difficult to get around. They tend to backlash when you are first learning how to cast this type reel. It takes much practice and patience to get a feel for casting and handling the baitcasting reel. The spool tension knob and magnetic braking are two features on the reel that can be used to control backlashing. There is a drag system controlled by a star shaped wheel. It is located just behind the handle. When casting, you must place your thumb on the line spool. As the line is going out, apply more pressure or less pressure with your thumb to control the speed of the line going out. This is the “feel” you must develop between your thumb and your reel through practice and experience. If the spool starts spinning faster than the line is going out then you will have a backlash. A backlash is a bunch of tangled up line that resembles a "birdnest". Backlashing is frustrating because it could mean you have to replace all the line on the reel. Replacing line takes away from pulling in lunker bass. Dang it! But don’t get all stressed out over backlashing because it happens to all anglers, even experienced pros. Once you get used to operating the baitcasting reel, you will begin to sense how well built and good it feels in your hand. Spinning Reels are constructed entirely different and are easier to use than baitcasting reels. They have a stationary spool and an open face. Line is wound around the spool by a rotating device called a bail. 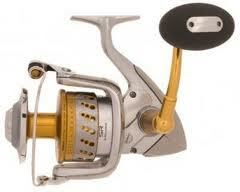 This type of reel can handle just about any size line but it is better to use line 10 pound test or lighter. Spinning reels actually operate and cast more effectively with lighter line and light weight lures and rods. Casting is a little bit of an adventure but not hard to learn. 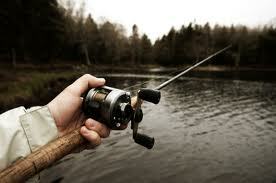 Take the rod in your hand and place your middle and index finger around the foot of the reel. Open the bail and hook the line with your index finger. Make a cast and let the line go by moving your finger forward. Control the speed of the cast by letting the line bump against your finger. Apply pressure with your finger to stop the line. To retrieve the lure, close the bail and reel in the line. The bail winds the line around the spool. 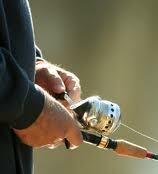 Spinning reels are designed so the handle can be placed on either side of the reel for left or right handed anglers. Most spinning reels have a front drag positioned on the front of the spool that looks like a dial. Always check the drag before you make your first cast of the day! The Spincast Reel is the easiest bass fishing reel to use. I read somewhere this type reel is for beginners and children. I read somewhere else that many experienced anglers use it for its simplicity. I guess I fit in there somewhere. I use the spincast reel because I grew up with it and I like the way it feels in my hand. I have used the others but I always come back to the one that works best for me. This type bass fishing reel has a stationary spool encased in a cylinder with a closed face. On the rear of the cylinder is a button to disengage the line. The line is wound around the spool by a pin that rotates inside the cylinder as you turn the handle. Spincasters are fairly tangle free and easy casting. To make a cast, place the rod in your hand with your index finger on the trigger of the rod. Press the button with your thumb and hold it down. Cast the lure forward and release the button. When the lure is where you want it, turn the handle one revolution. This will engage the line so the line cannot be pulled out if a bass hits your lure quickly. To retrieve the lure, turn the handle. It is that simple. Many models of spincast reels are made to handle almost any size line. Be sure to match the correct size lure to the line test in the reel. The drag on this type reel is usually located on top of the cylinder near the button. I want to talk about Gear Ratio for a minute. It really is simple. If it was hard to understand I would not even be talking about it. All bass fishing reels have a certain gear ratio. The gear ratios on a bass fishing reel range from 3.8:1 to 7.3:1. It varies by the different types of reels. The most popular is about 5.2:1. This means that every time you turn the handle one complete revolution, the spool turns five revolutions. So let’s say you have one reel with a 5.2:1 ratio and another reel with a 6.3:1 ratio. The reel with the 6.3:1 ratio reels line in faster because the spool makes more revolutions per one turn of the handle. Think about that for a second. Think about which lures need a fast retrieve and which lures need a slower retrieve. I mention this because a lot of serious anglers take this into consideration when purchasing a bass fishing reel. And don’t forget about the Reel Drag. This mechanism comes into play when the bass makes a run and is trying to pull out more line. It will keep pressure on the line but still allow the lunker bass to pull out line when it is pulling hard. This keeps the line from breaking when you are in a panic and screaming and hollering all over creation. Be sure to check the drag before you make the first cast! The Fly Reel should be mentioned here. 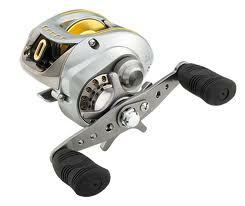 It is a member of the family of bass fishing reels but it is hardly ever mentioned. It is very simple. It is just a small wheel hanging below the fly rod handle. It has no function in casting the line. The wheel has the fly line wound around it. After the line has been cast, the fly reel is used to retrieve the line. This is done automatically by a mechanism in the wheel or manually by turning the wheel with an outside knob. Fly fishing for bass is really fun. It takes some practice to learn how to use the fly rod and reel. If you ever hang a good size bass while fly fishing, you will have a good fight on your hands. I will offer one tip here. When fly fishing, you need plenty of room all around you and OVER HEAD. Watch for power lines!